Artist Nicola Ellis will be making a brand new work inspired by Sheffield’s historic steel industry and the gallery’s previous usage as a grinding shed by Granton Knives. The final phase of More room for error reflects the research that she has been conducting over the past 6-months, meeting and speaking with local historians and knife grinders to learn about the techniques and tools that were and are now currently used in the city. Dissecting the gallery, Ellis’s new work will employ traditional techniques and skills to respond to the architecture of the gallery space. Within More room for error, Ellis looks at material components that are often intentionally hidden in structures and spaces. Exposing the weld or stitch between materials and highlighting their imperfections, her work questions underlying assumptions around the functions and roles of different objects and materials in architectural space. 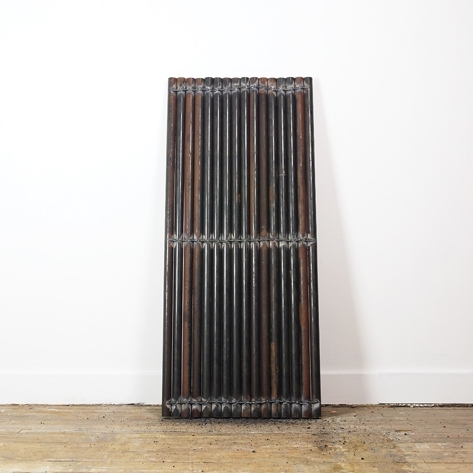 Much of the focus within the project is based around Ellis’ investigations into metalworking, with a particular concentration on welding or joining steel. Ellis has studied, researched and learnt the industry standard rules, which she has then gone on to question, dissect and divert into a methodology for creating art works. The results of this investigation, mixed with acts of ‘play’ and interpretations of space, offer an opportunity for us to consider the relations between what is sculpture and what is structure. More room for error is a touring exhibition of new works by artist Nicola Ellis examining the physical join between objects and the space they inhabit. Commissioned and curated by Mark Devereux Projects, the project visited Arcadecardiff (Cardiff) in May and &Model (Leeds) until 19 September. Complementing the exhibition, Mark Devereux Projects have commissioned a new publication featuring an essay by &Model Director Derek Horton and works made during the project. More room for error is funded by Arts Council England and has been developed, supported and commissioned by Mark Devereux Projects, with thanks for support from Eltec Engineering Services, Littoral, Arcadecardiff, &Model and Bloc Projects. Nicola Ellis is represented by Mark Devereux Projects. More room for error launches at Bloc Projects, Sheffield on Thursday 27 August and continuing until 12 September. For further details about the exhibitions, accompanying events and galleries opening times please visit markdevereuxprojects.com. Mark Devereux Projects has established a proven track record of developing artists’ practices and careers since forming in 2013. Mark Devereux Projects: * specialises in supporting artists during crucial transitional stages in their career * works collaboratively with artists, placing their core interests and ambitions at heart * believes in paying artists * supports artists both outside and within the commercial art market * provides tailored information, support and guidance through mentoring and professional development programmes * champions art which is compelling, critical and ambitious * produces and curates exhibitions, talks programmes and events that challenge artists and audiences * encourages creative risk * forges connections between artists, galleries and audiences * advocates for artists and works to enhance their national and international profile Many of the artists we have worked with have gone on to receive important commissions, prizes, exhibitions and grants that have furthered their careers. Mark Devereux Projects is a Company Limited by Guarantee (8818208), receiving project based funding to support our activity and programming.